For many people, feet are pretty much the least exciting part of the human body. They are not great to look at and can be pretty smelly too if they’ve been shoved in a pair of sneakers all day long. This photographer thought it would make a great photo if they took a loving couple and edited it to look as though they appear on this person’s foot. 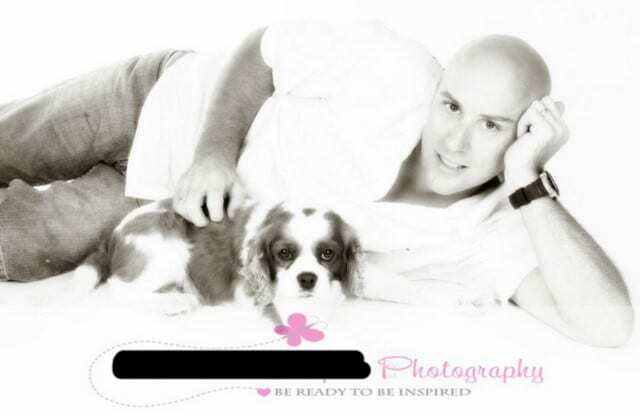 We just have one question to ask the photographer… Why? You know when you run out to the store, and all you come back with is a baby in a sack? We’re sure this photo is meant to make it seem as though this young child is a precious gift but all we can compare it to is a sack of vegetables. You can barely even see its face, and when you do see it the expression on its terrified little face tells us that it does not enjoy being thrown into a sack as though it has been snatched. Kids are curious creatures, they aren’t afraid to ask questions or do things that the rest of us have been conditioned to stop doing by the time we reach adulthood. This mom to be is letting a bunch of children listen in on whatever’s going on inside her tummy. The jokes on these kids though as she just ate a really spicy chili and it sounds as though the baby is going to erupt out of there at any second! If you’re a professional photographer you would most likely save your best pictures for marketing. After all, you want people to know that you’re capable of creating beautiful and majestic images. What you definitely don’t want to do is post a lousy image around your local area showing exactly how not to take a photo. This “Picture-Lady” has taken a sleeping child and made it look as though there is an eruption coming from underneath its diaper. Photoshop has changed how photographers work, and can often be used to fix some issues when the pictures were taken. This led to it being overused in the media and often on magazine covers the models and celebrities were being Photoshopped to look like completely different people. This photographer has not quite mastered the art of Photoshopping, and instead of making this person look better all they’ve managed to do is blur their face beyond recognition. Good going photographer! 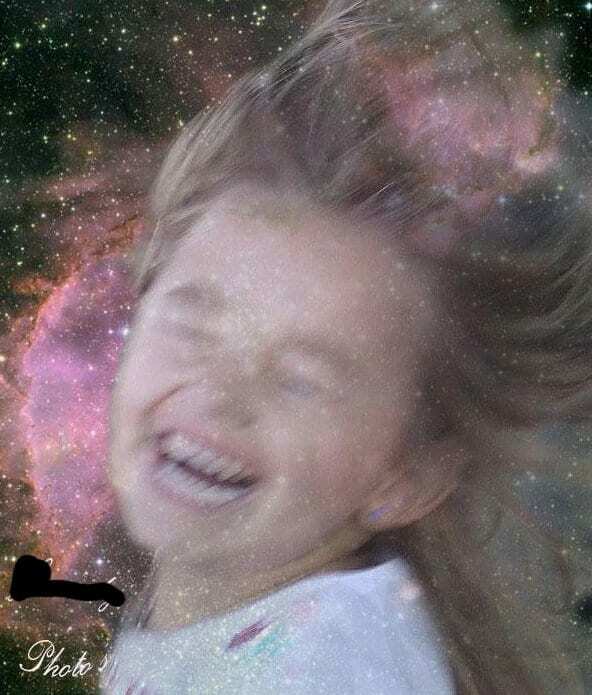 You want people to know that your child is out of this world and truly a shining star. 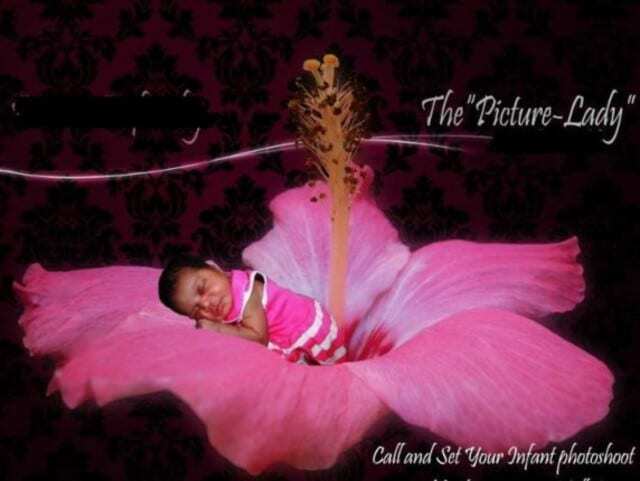 You ask your photographer to make that thought become a reality, and this is what they offer you. This photograph probably could have been exactly what the girl’s family were asking for, if only the photographer could get the girl to sit still for a second. There’s nothing like an expensively blurry picture to make you feel like you’ve gotten value for money from a professional photographer. Love is… black and white? It seems as though this photographer has got things in reverse. Surely this couple’s love is so captivating and magical that only when they are together are they in color? Instead, all of the color is on the outside of the frame, leaving us to wonder if this couple are as in love as they might want us to believe. Now it just looks as though when they are together their lives are pretty grey and bleak, while the rest of the world is happy and colorful. The wedding vow, “until death do us part” is a sentiment that is meant to signify the couples lifelong commitment to each other. This is a pretty grave wedding invitation. Even though this couple might really like hanging out with those who have passed, their photographer could have made their wedding invitations seem a bit more, well, inviting. 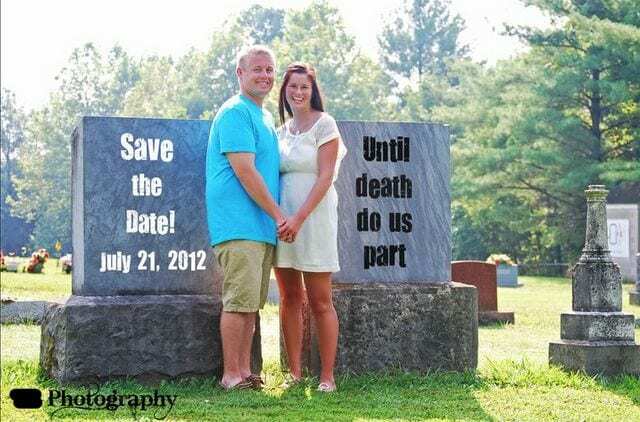 Adding basic font over these gravestones is probably something the couple could have done themselves, so we aren’t sure how this photographer earned any money from this shoot. It seems as though the issue of professional photographers doing bad jobs is not exclusive to English speakers. This Spanish-speaking photographer wants people to know that if they are having a wedding then they are the person they need to bring along to make sure they have some truly great pictures of their day. 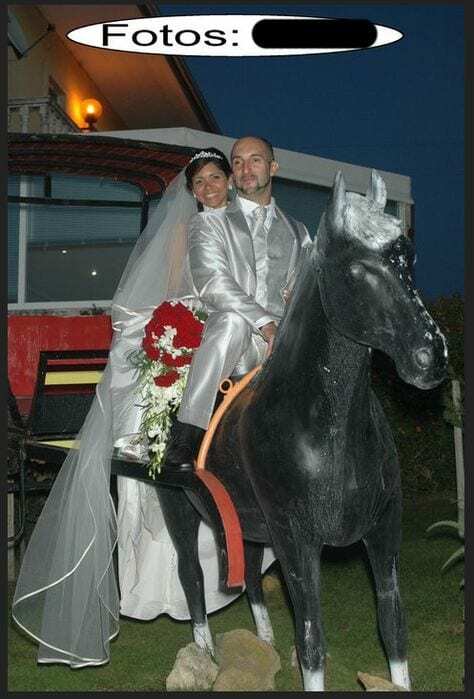 This couple have awkwardly placed themselves on the back of this huge plastic looking horse, but the photographer failed to get them both looking at them when taking the shot. This picture is one of those classic moments when someone thinks they have a great idea and no matter how much they are told it won’t work they insist it will. Whether it was the family or the photographer who insisted on this shot, we don’t know, but we do know that it has definitely not worked. There’s nothing like setting a good example for your kids, and mocking them up as criminals is probably not the best way to go about it. People want to look their best when in a picture, after all, it might be the image for someone to remember you by. This woman has gone into a professional photoshoot probably expecting to be made look glamorous, and all it looks as though she is doing is squatting behind some bushes. There’s nothing wrong with trying to pose seductively, but the photographer is looking right at you and should be able to tell that instead of alluring, you look as though you’ve been caught going to the restroom. Don’t worry, there’s nothing wrong with your screen, this is just a terribly taken picture. Normally with a picture frame, you focus on what’s inside rather than the frame itself, but this photographer felt as though the frame was much more interesting than the people. 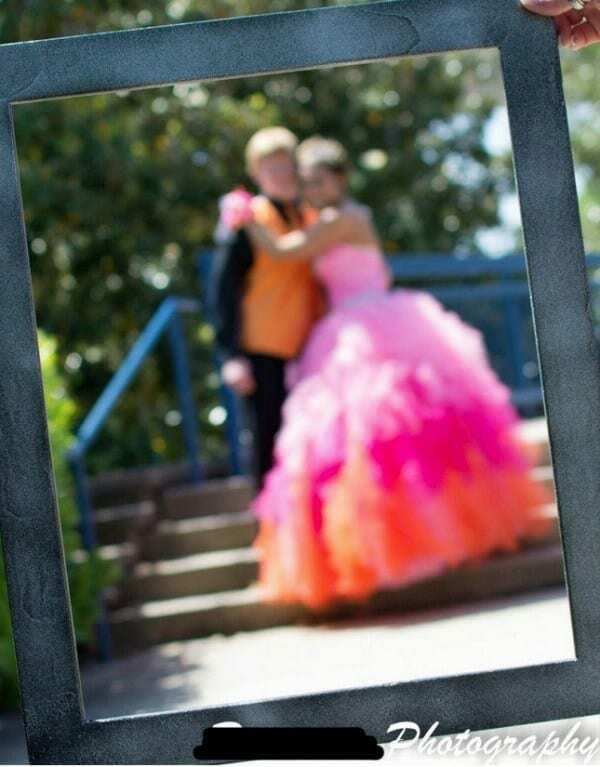 The only reason we can even tell they are there is because they are wearing incredibly bright clothing, hopefully whoever went to the prom with these guys took some better pictures of their own for them to remember their special day. 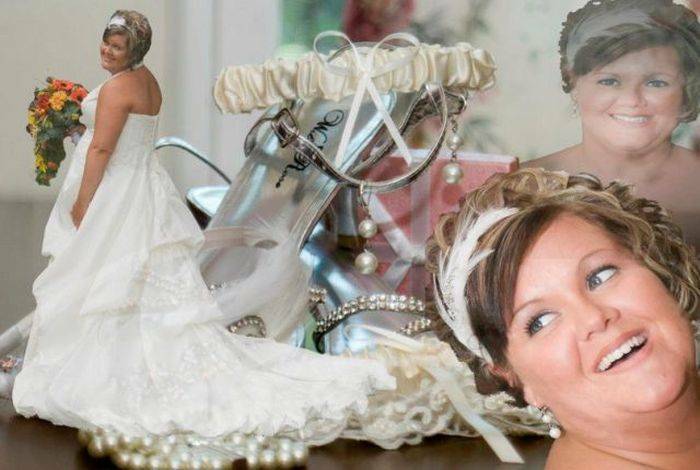 Either this woman is so small she’s marrying a pair of shoes, or there’s a photographer on the loose who is not very good at using Photoshop. The woman has been shrunk down to the size of her shoes for some reason. As though that wasn’t strange enough, her floating head is glancing at them from another angle, then her ghost is in the top corner staring into our souls. We’re guessing this woman really likes shoes and the photographer suggested this could be a fun shoot? This shot is pretty disturbing. 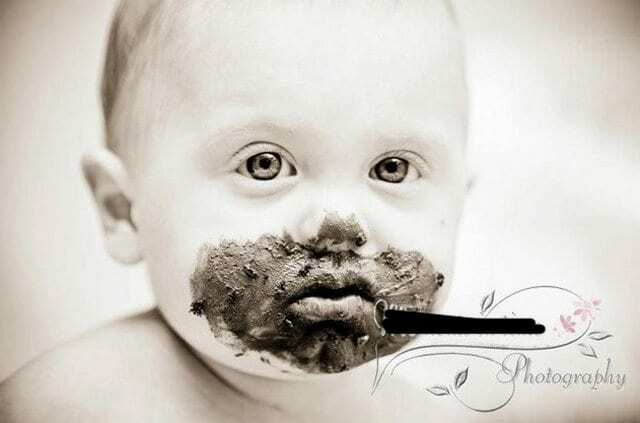 It’s probably meant to look like chocolate smeared across this baby’s face, but it looks more like it has been rummaging around in its diaper with its face. 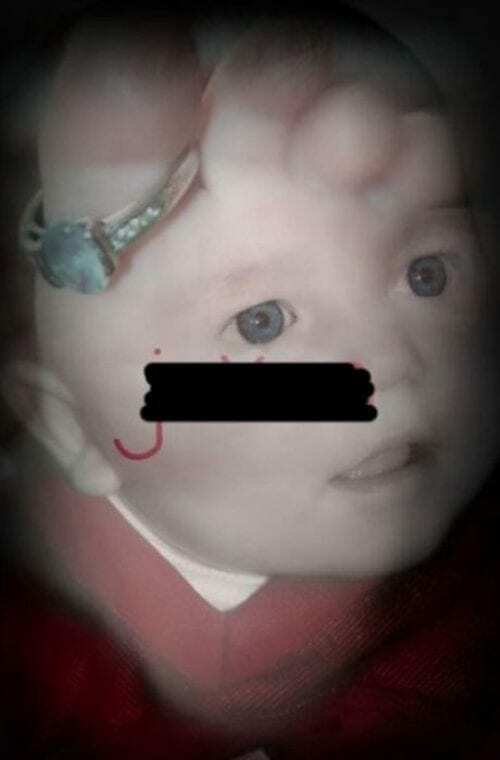 The photographer was clearly so proud of this picture that they put their logo over the top of it, hoping that other people would want to subject their babies to the same treatment as this one. Hopefully the photographer isn’t waiting by the phone waiting for new customers to call. Montages have been used in films for many years to show the viewer some sort of progression; think of all the times Rocky Balboa spent working out in mountains or chasing chickens while Eye of the Tiger played in the background. 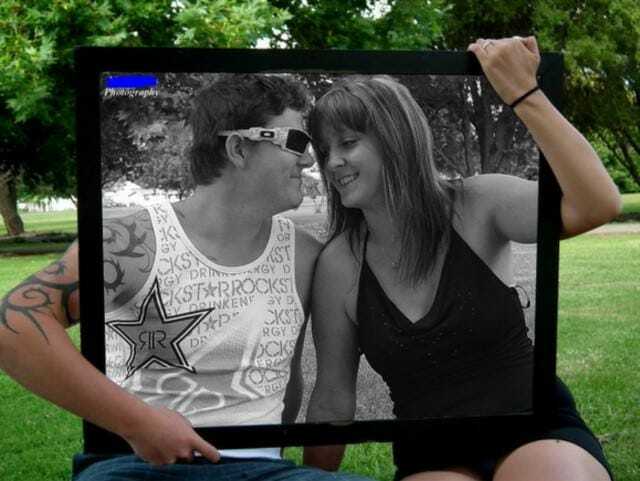 This photographer also loves a montage and wanted to find a way to showcase their montage making talents. They pieced together five pretty small pictures of a baby, including a close up of its feet, before spacing them as far apart as possible with so much black in between. Beautiful. 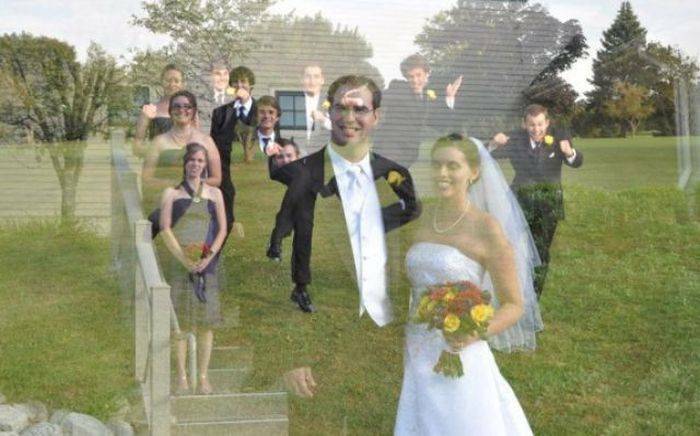 There’s a real demand for cute couple pictures, and this couple wanted to join the cute couples party. They looked up a professional photographer, made their appointment and then excitedly waited for the day they could get in front of the camera. 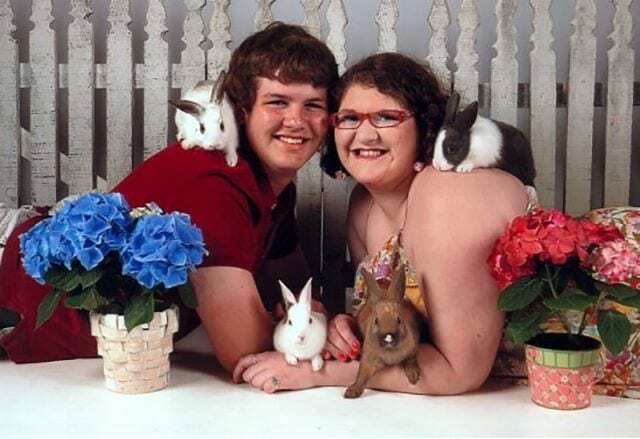 This couple loves their bunnies, like children you might say, so they knew they needed to bring along their rabbits for a family portrait. The challenge to the photographer, make this scene look as natural as possible. We did warn you! If your retinas haven’t burned out of your eyeballs, then you’ll notice a lot of white. 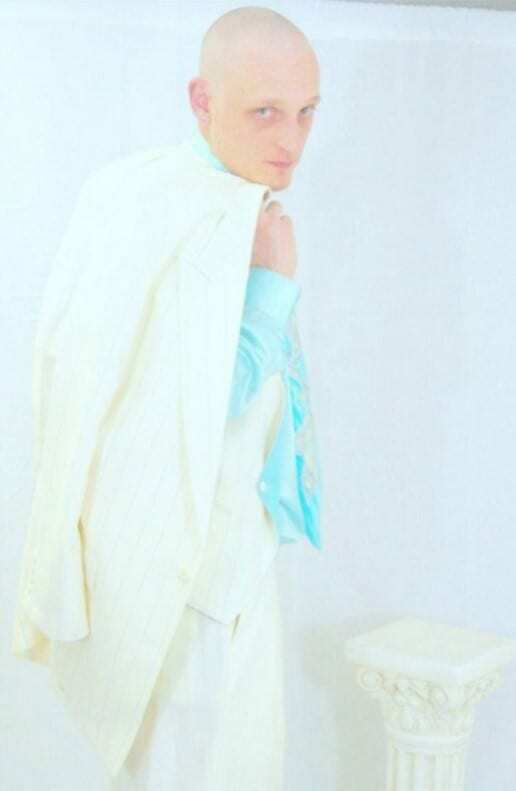 This pasty guy dressed himself in white and a very pale blue presenting a challenge to the photographer who only brought a white background and marble column with him today. It’s alright, he can just adjust the exposure on the camera, and the guy won’t seem as though he’s never seen daylight. Not quite, and the photographer didn’t really manage to earn their money on this picture. Let’s take a loving pregnancy shot where the dad of the soon to be mom lovingly kisses the baby bump that will shortly transform into a living and breathing little person. Also, lets crudely photoshop a baby, who isn’t inside this woman, onto the mom’s baby bump and give everyone nightmares. That sounds like a great idea, how would something like that turn out we wonder… Turns out not good, not good at all, hopefully this picture is a one of a kind. We can imagine this mom pitching her idea to the photographer. 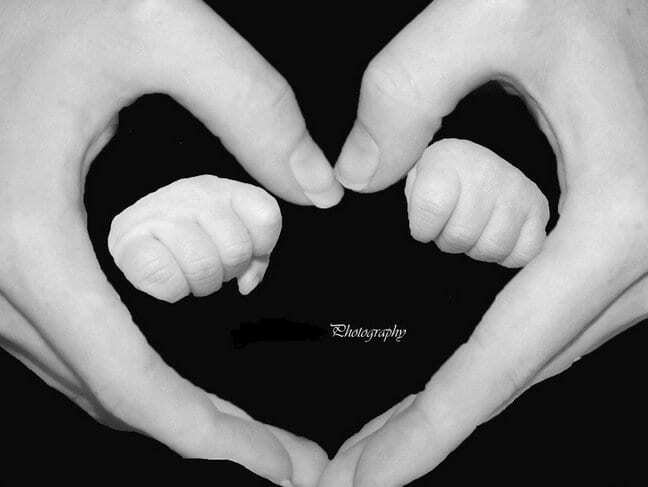 “I want my hands in a heart, with my baby’s inside them.” Pretty simple, and probably achievable by just having the mom make the heart shape before placing the babies hands in hers. Why go the simple route though when you can Photoshop?! Now we have some poorly cropped baby hands looking very out of place inside its mom’s heart-shaped hands. 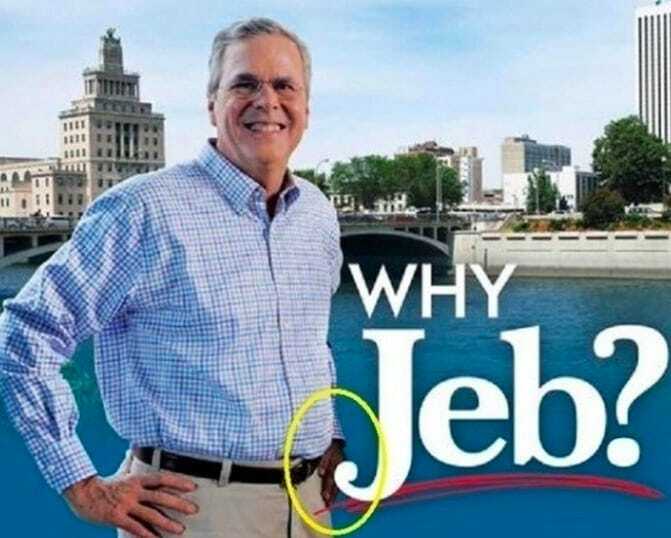 Photoshop isn’t the answer to everything! There must have been a lot going on in the studio this day. 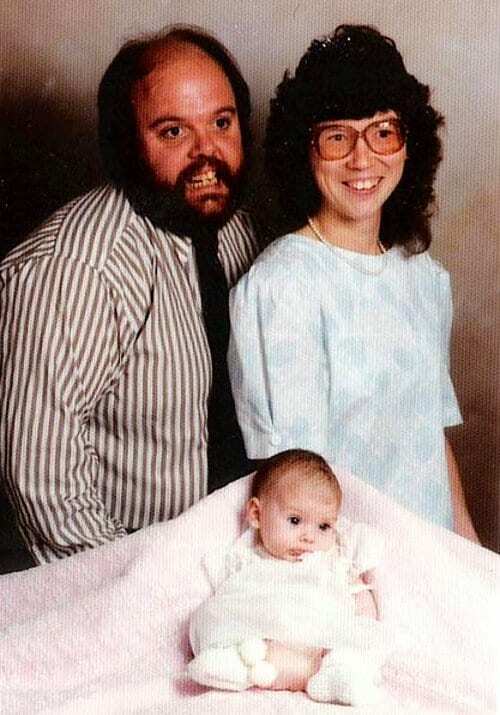 The dad really doesn’t look like he wants to be there and the baby isn’t too keen on the whole thing either. Dad has finally cracked a smile after an hour of trying, but it’s taken so long that the baby has started to fall from its place. At least the mom has had a lovely day out and one she’ll remember forever. Guess who just upgraded their photo editing software? This photographer! This couple wanted a fun way to announce they are going to have a baby and thought hiring a professional photographer would be the best way to make their announcement to their family and friends. 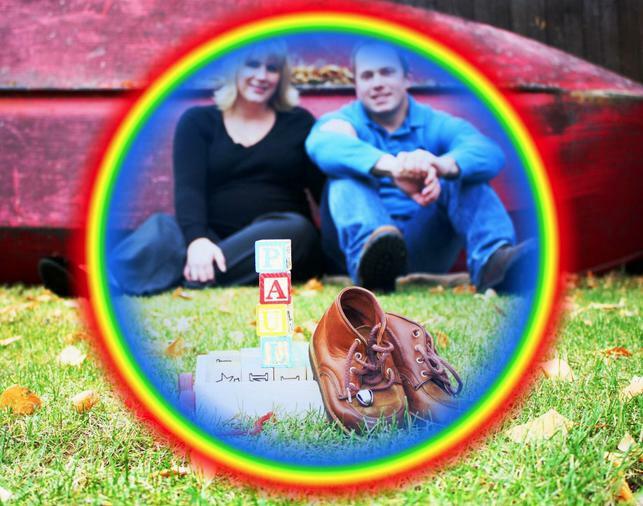 Before they knew it, they were being placed in the middle of a rainbow ring with an old pair of leather boots, some spelling blocks and whatever the things on the ground are meant to be, maybe feeding bottles? Where to even begin with this photo. Let’s start by saying we hope this is a bad Photoshop fail on the photographer’s behalf and not some kind of mutant foot baby thing. Which leaves us asking why this baby has a foot growing out of its head? What purpose does that serve? Also, there is a ring on the big toe, is this some kind of engagement photo? We hope the baby grows up to live an enjoyable and fulfilling life without a (perfectly rational after this picture) fear of feet. This photographer wants people to be prepared to be inspired, but they seem to be trying to distract us by making everything super bright. Being a bald man often comes with the problem of the sun beaming off the top of your head, but when trying to look your best it’s probably not the greatest thing to draw people’s attention to it. Everything is just so bright and white in this picture we barely even noticed there is a cute little doggy in the middle. 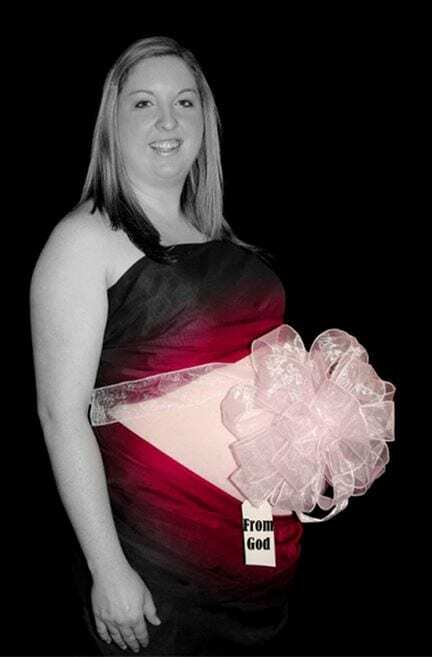 People often like to say that their children are like a blessing, so in anticipation of giving birth to a little angel this woman has stuck a huge ribbon on her pregnancy bump with a gift tag from God. It’s hard to tell, but it also appears to be glowing red, which typically is the color of the opposite of God, so it looks as though she’ll have to wait until this baby is born to find out if it’s good or evil. Thankfully this picture is just badly edited, and the horse wasn’t really used as a prop for this woman. This photographer has used this image as advertising, assuming that it’s something that people look for in a photographer. “Hey, come to my photography studio, where I’ll take your picture, but then edit it to transport you to the back of a horse.” It doesn’t matter what pose you do, you’ll end up on the back of a horse no matter what. Some people are just so attractive they steal the focus in any picture taken of them. This guy knows he’s handsome, but worries that his female companion is going to outshine him. He had a word with the photographer beforehand and arranged it to make sure that no matter what he stole the shot. There are probably a hundred photos of this couple, but in each and every one the guy has his hand over her face… As per the photographer’s instructions of course. This baby has a big future ahead of it. The baby’s parents believe she will one day tame a tiger, but not wanting to test out their theory just yet, decide for now they are happy for a photographer to make it seem as though she is riding this deadly cat. Not a problem for this professional photographer who is ready to create a masterpiece. 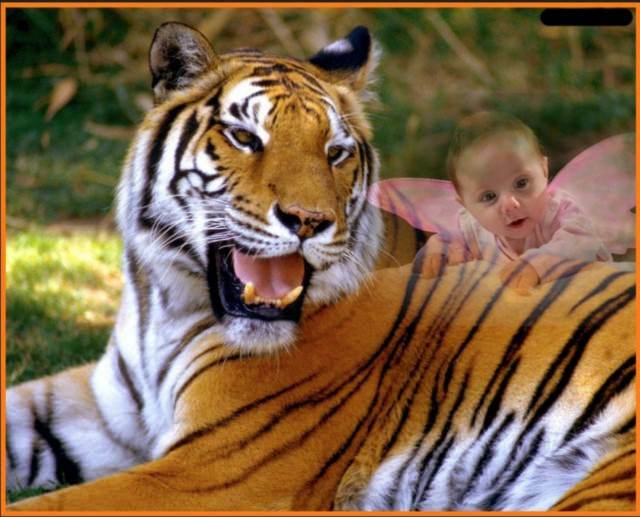 The little girl was crudely pasted onto the back of the tiger, but for some reason, she has a ghostly glow about her. This photographer can take any situation and add the one thing every picture needs, fire! This is him, hard at work while crouched in the middle of a burning inferno. Do you like fire but hate that nasty burning sensation you get when standing in one? 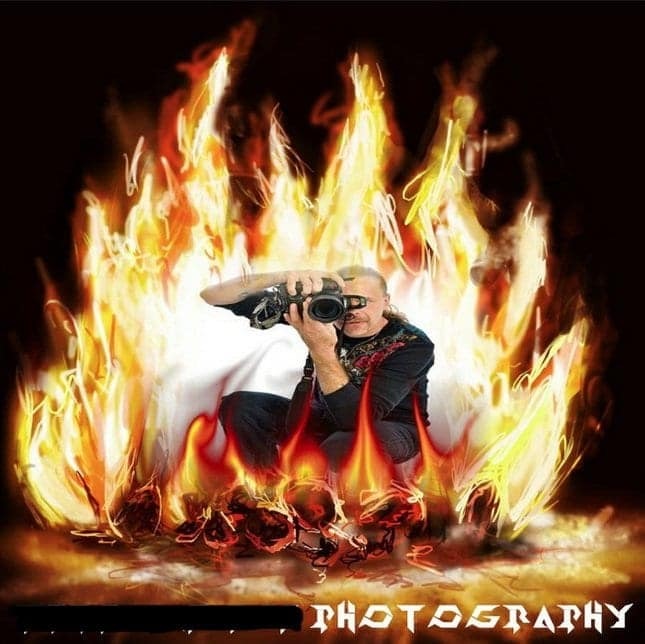 Come to this guy who’ll take a picture of you and then stick you in the middle of any fire. Roll up, roll up, pick a fire, any fire! 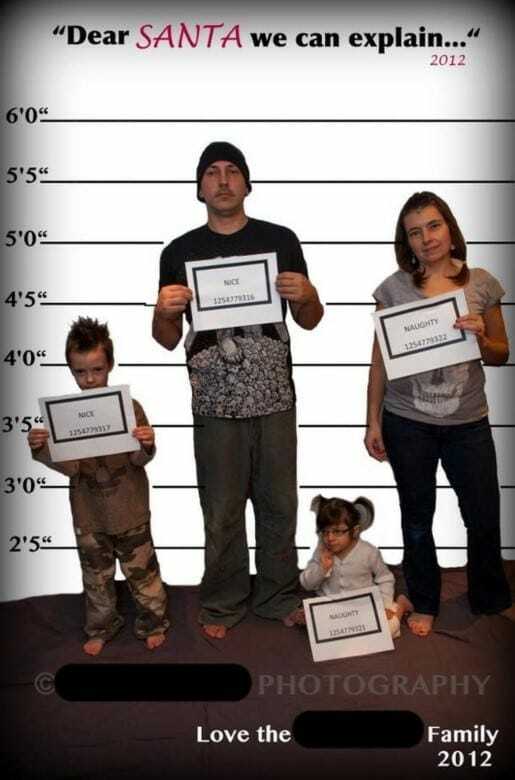 This professional photographer, yes we said professional, was asked to create a family portrait for these guys. They certainly did that, and it’s a memorable one for sure. These people’s faces have lost all definition and instead are something you might expect to see in a horror movie. The biggest travesty of the entire shoot? 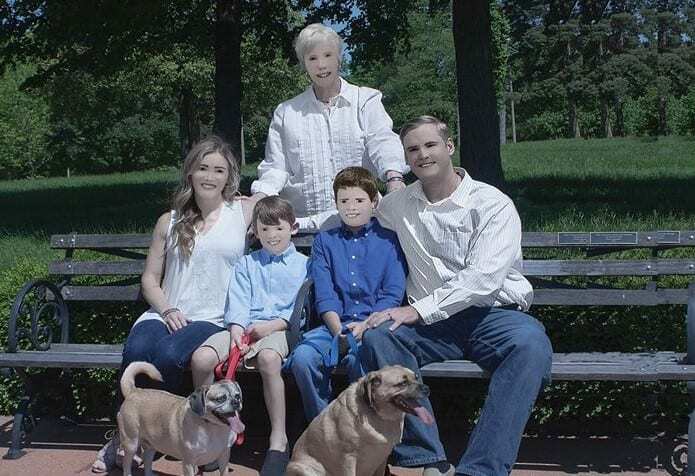 The photographer left the dog’s faces as they were, we wanted to see them work their Photoshop magic on our little four-legged friends. Ghosts need love too! This couple wanted their day to be incredibly special and memorable, like most couples who get married do. The photographer thought they would try out a new technique they’ve learned and tried merging one shot with another. We think we’ve figured out what’s going on and there is a picture of the bride, groom, and the wedding party. Then there is a picture of the best men jumping in a field that has been included in the shot for some reason. This family loves nothing more than getting out of the house and into the wild outdoors. They each have their own camouflage shirt that they proudly wear when outside. 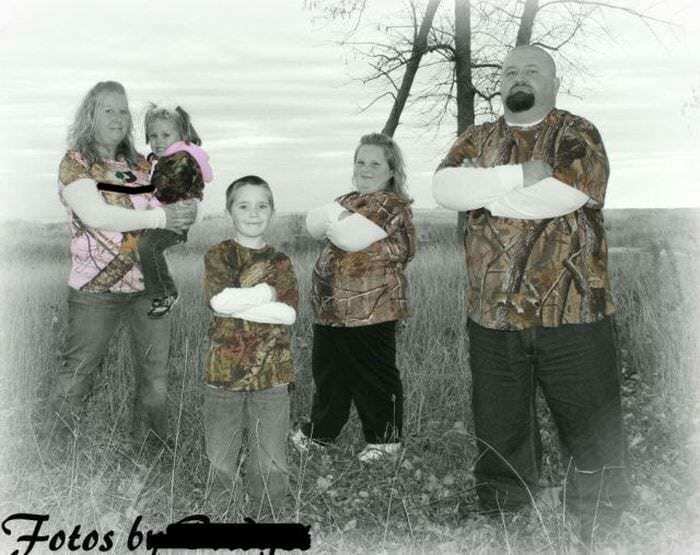 Instead of focusing on the family, this photographer focused on the camo shirts, removing all color except the color of the shirts. The effects used around the outside edges of this picture make it seem as though it’s some kind of dream, which we guess is the look the photographer was going for? The picture on the left has absolutely nothing wrong with it, so we don’t suggest you look for anything strange. As for the picture on the right – that’s a whole other story. It seems that when she decided to wear the black dress, the photoshopper thought he’d have some fun with the coloring. We’re guessing that he wanted to accentuate the curves of the dress, but here’s the problem – he took a solid chunk out of the woman’s left arm in the process. When it comes to models, clothing companies will try to go above and beyond to make sure they look perfect in their advertisement. They might even go so far as to, say, photoshop their feet to do things that aren’t humanly possible. If you take a peek at this lovely young woman’s right foot, it’s facing the opposite direction that it should be – and it looks very strange. It may have been on purpose, but something tells us this was an oversight. Another type of company that are always compelled to make themselves look a step ahead of the competition are the airline companies. 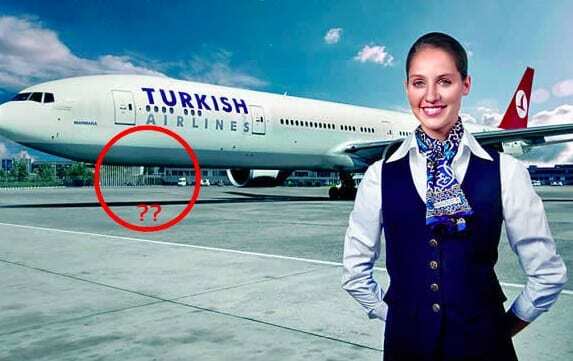 In this advertisement for Turkish Airlines, they may have accidentally taken things too far with their photoshopping. As you can see, the landing gear is nowhere to be seen. This is normal when the plane is in the sky, but when it’s on ground? Not so much… That is one impressive looking plane. One of the funny things about modern culture is that even as people try to modify their body image using digital tools such as photoshop, they find themselves getting more than they bargained for. It seemed that this young lady wanted to accentuate her curves, and as a result was given a little curveball as a result. As you can see, her right forearm doesn’t look normal at all, and she may have been better off not touching it at all. Some a common thing in this day and age is people wanting to be in shape. Girls are trying to look like the supermodels on the magazines, and boys are trying to look like Dwayne Johnson, or some other dude with a six pack. 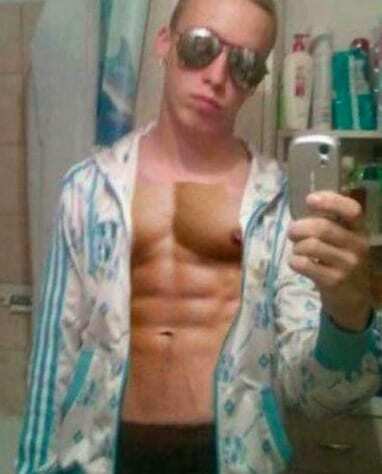 The young man in this picture thought he’d have fun with photoshop, and added the six pack of a bodybuilder to his frame. He probably just did it as a joke, but the result wasn’t subtle at all. Speaking of avoiding subtleties, this young man did the same thing! 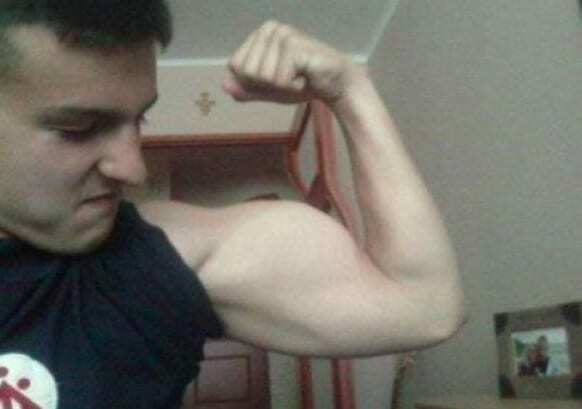 In his case, he photoshopped his bicep instead of his abs – but the result is no less hilarious. In a weird way, this picture actually looks slightly more realistic than the previous one, because he happens to be holding something heavy, making it look like he’s actually working out his arm. That said, things get a little fishy when his right arm doesn’t match up with his left. 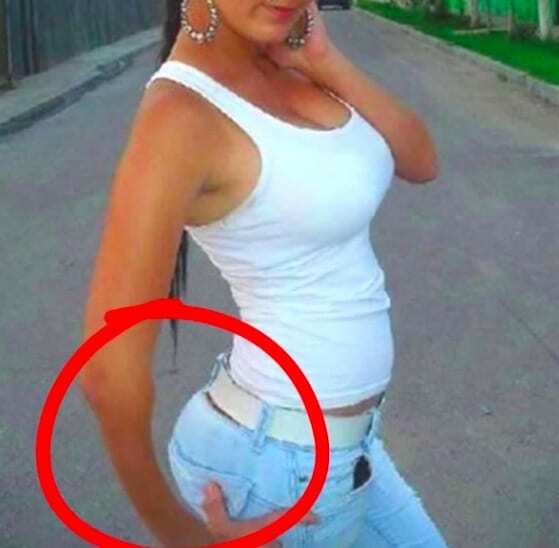 There are all kinds of photoshop fails that people have done over the years, but this one is by far one of the worst. It’s one thing to accidentally alter the shape or angle of something, but it’s another to change the color. As you can see here, someone made this man’s left hand that of an african american, when it’s clear that he’s obviously not. It’s pretty comical when it really comes down to it, but they should’ve seen this one coming. Whether you’re a sports guy or not, chances are you’ve heard of this guy before. His name is Michael Phelps, and he’s an American professional swimmer who won a number of gold medals for Team USA in the Olympics. But right now we’re not here to discuss accolades. We’re here to talk about where that mysterious hand came from. You know, the one that’s holding on to Phelps’ right arm? Yeah, that’s totally not strange at all. As you first look at this picture, it would seem that there’s actually nothing that crazy going on. Sure, there is a young man flexing a big bicep, but that’s not too uncommon, is it? Well, it turns out that there’s a reason his bicep looks the way it does. 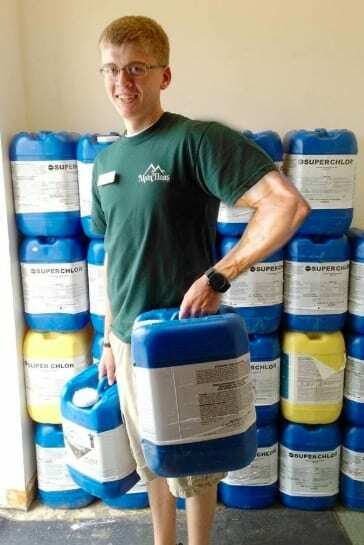 It’s because it was photoshopped to look bigger than it is, and here’s a little tip: Take a quick look at the door behind him, and you’ll see why things are not exactly as they seem in this picture. Have you ever heard of people who don’t eat or drink?